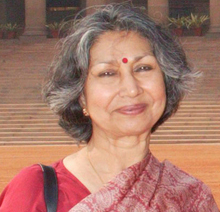 Pushpa Sundar has over 30 years of experience in the field of development and civil society. Starting her career as an Indian Administrative Service officer in 1963 (from which she resigned in 1966), she has since worked in a variety of organizations—national, and international, non-profit, government and corporate, such as the Ford Foundation, the Government of Gujarat, FICCI, and the National Foundation for India. She has also consulted for the World Bank, the Asian Development Bank, the Nand and Jeet Khemka Foundation and others. The exposure to international philanthropy as Senior Fellow under the International Fellows in Philanthropy Programme of the Johns Hopkins University in 1995 led to her being the moving spirit behind the establishment of Sampradaan Indian Centre for Philanthropy, New Delhi, a national intermediary organization to promote and strengthen Indian philanthropy, and becoming its fi rst Executive Director (from 1996 till July 2005). She was also associated with WINGS (Worldwide Initiative for Grantmaker Support) and WINGS–CF (WINGS Community Foundations) from their inception till recently. She is currently a trustee of Partners in Change, Delhi, a nonprofit organization promoting corporate social responsibility, having been associated with it since inception as a founder member. She has also been on the board of several other non-profi t organizations such as the Indian Institute of Health Management Research (IIHMR),Jaipur, the Sanskriti Foundation, New Delhi and South Asian Fund Raising Group, New Delhi. She has written extensively in national and international journals, newspapers, and magazines on a variety of subjects, especially on issues of social concern. Her published works include Patrons and Philistines: Arts and the State in British India, Beyond Business: From Merchant Charity to Corporate Citizenship, Foreign Aid for Indian NGOs: Problem or Solution?, For God’s Sake: Religious Charity and Social Development in India.